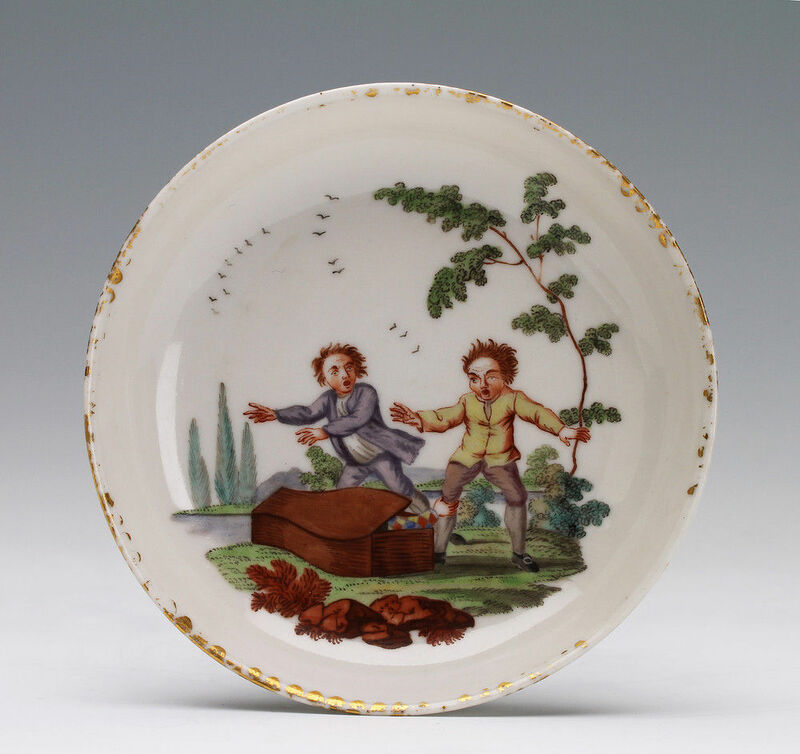 The Irish artist Jefferyes Hammet O’Neale is best known for designs on Chelsea porcelain adapted from the engravings in editions of Fables of Aesop by Samuel Croxall D.D. 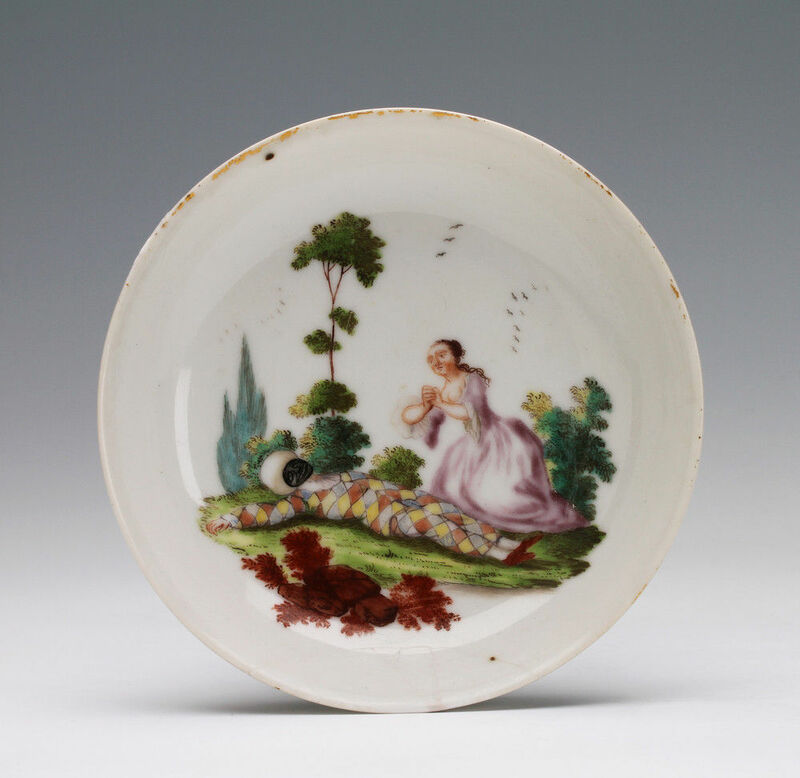 For a brief period in the late 1750s, probably when there was little work at Chelsea, O’Neale worked on Chinese export porcelain in the London workshop of the decorator and ‘chinaman’ James Giles. The popularity of the Italian Comedy in London in the 18th century is well documented and they were often performed as ‘afterpieces’ to more serious plays. 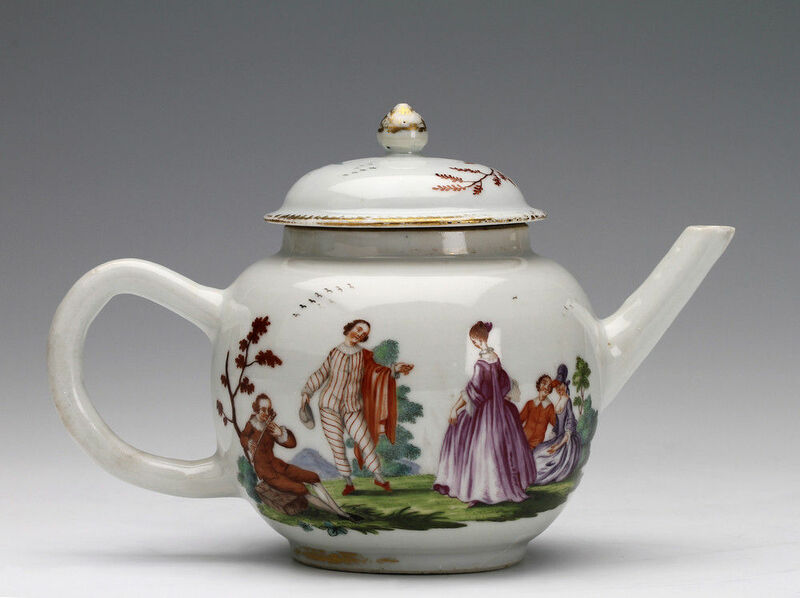 The scenes on this service seem to depict a continuous narrative but no graphic source is known, it was perhaps some theatrical play bill or series of illustrations to a harlequinade that have not survived. The scenes show an apparently dead harlequin being lamented over by Columbine yet later emerging from a coffin to terrify the onlookers. Amongst the numerous performances of harlequinades recorded was one performed on the 4 March 1754 at the Little Haymarket entitled The Coup de Grace; or, The Death of Harlequin. O’Neale’s work is characterised by a witty and lively interaction between his figures and animals with a sense of fun and immediacy. Of his different styles the Commedia Dell’Arte or Italian Comedy is by far the rarest. The only other recorded pieces are, a smaller part tea service in the British Museum (illustrated in Ancient Chinese Trade Ceramics from the British Museum by Regina Krahl and Jessica Harrison-Hall, 1994, p. 348, no.158) and the teapot presumed to be from this service in the Royal Museum of Scotland, two coffee cans in a private collection (Illustrated Stephen Hanscombe, Jefferyes Hammett O’Neale, China Painter and Illustrator, London 2010, no. 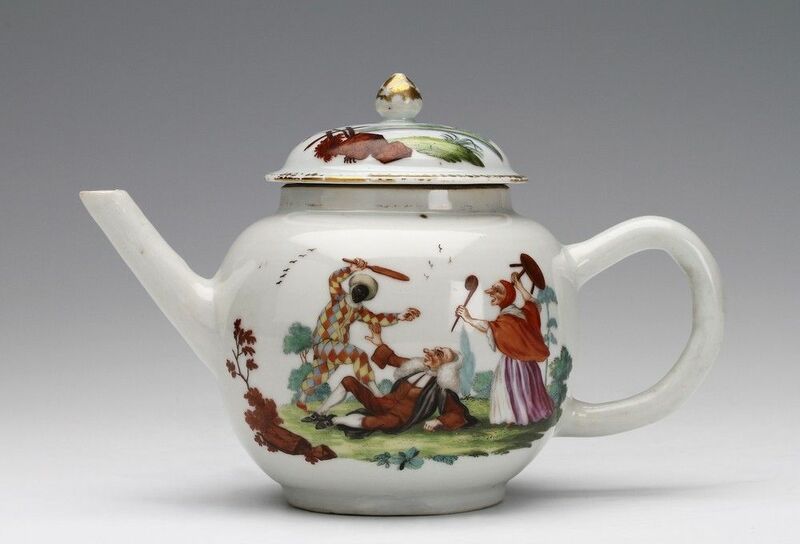 84 p. 96, and a teapot in the Peabody Essex Museum in America (illustrated William R. Sargent, Treasures of Chinese Export Ceramics from the Peabody Essex Museum, 2012). 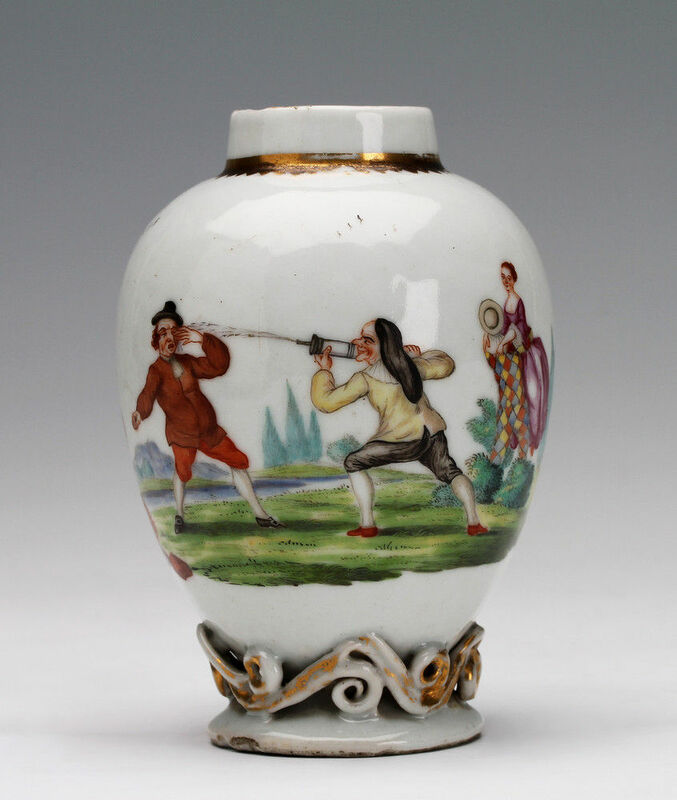 This is the most important group of O’Neale decorated Chinese porcelain known. Condition – Detailed condition report available on request. The teapot has some restored chips, the tea canister and short hair-crack. The sugar bowl and some of the tea bowls and saucers are badly damaged. 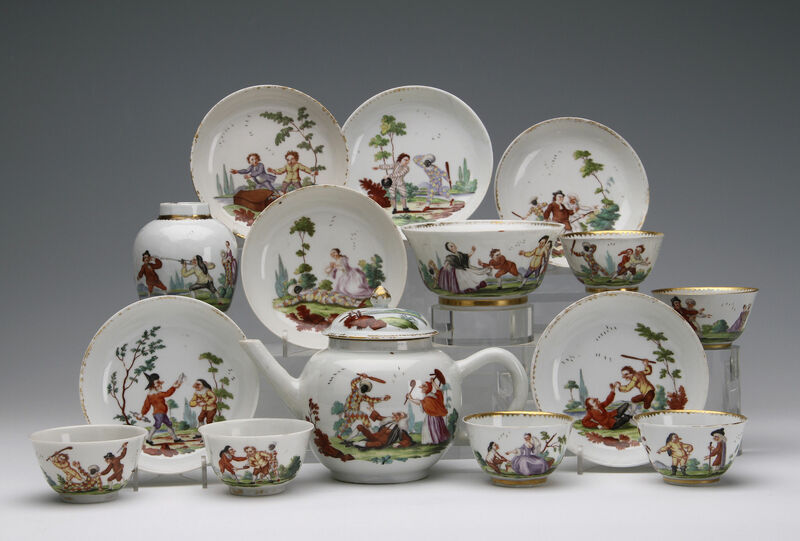 Exhibitions – The service has been on loan to the Norton Museum of Art, West Palm Beach, Florida for their Exhibition High Tea, Glorious Manifestations, East and West, curated by Laurie E. Barnes from February 19 to May 24, 2015. It is illustrated in the catalogue on pages 96 and 97. Keramik-Freunde der Schweiz, Mitteilungsblatt Nr. 40, October 1957, ‘Nel CCL anniversario della naschita di Goldoni’, Giuseppe Morazzoni, p. 29, ill. 31, 32. Giuseppe Morazzoni,Le Porcellane Italiane, Milan 1960, Vol. I, pl. 49 & 50.